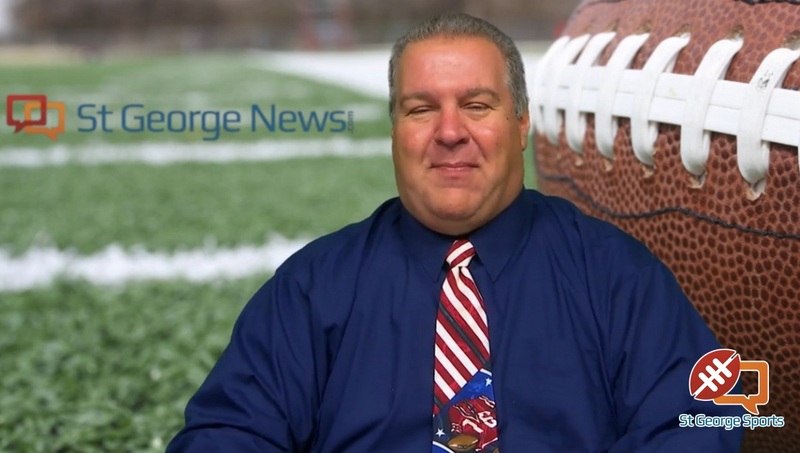 ST. GEORGE – It was a momentous and exciting year for sports fans in southern Utah and the St. George News sports department was there to witness the thrill of victory and, at times, the agony of defeat. Thanks, southern Utahns, for letting us be a part of it all. Below is a list of some of our favorites from 2016. It is not a comprehensive list — there were too many great moments to list them all. But it is a good list, to be sure. A special thanks goes to the coaches, athletic directors, principals and media liaisons who provided us access to these stories. 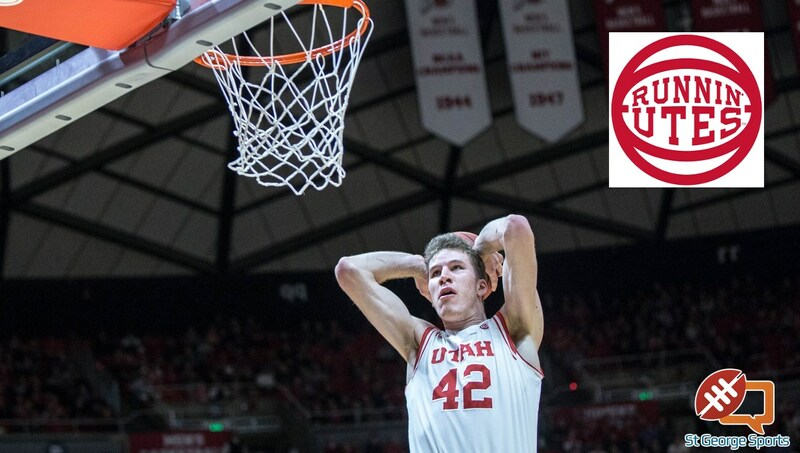 In a stunning announcement spurred by recent unsportsmanlike incidents by both teams, Utah basketball coach Larry Krystkowiak said his team would no longer play in-state rival BYU. Fans from both sides criticized the decision. 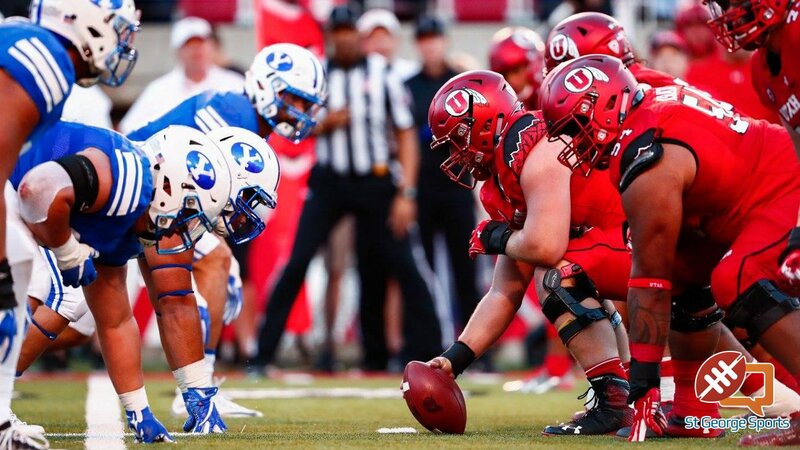 Despite the two teams playing in different conferences, the Utes and Cougars had maintained the rivalry since the programs both left the Mountain West Conference back in 2011. It was announced later in the year that the two teams would resume the rivalry after a one-year hiatus. BYU guard Kyle Collinsworth continued to redefine the college basketball point guard position with an amazing night in California. 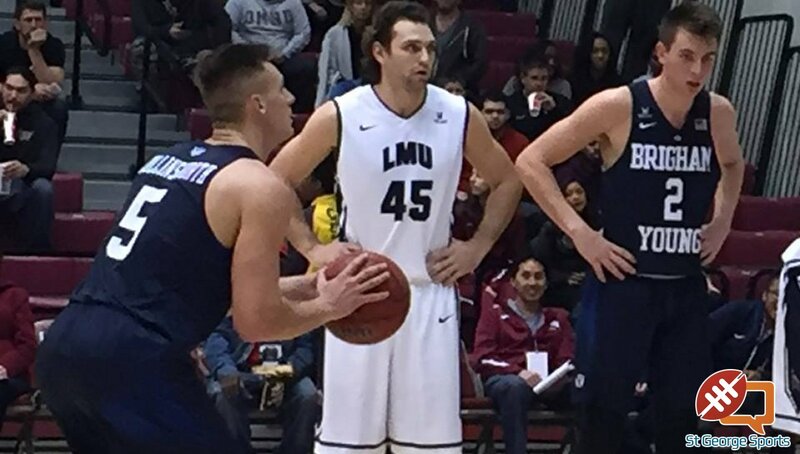 He finished with 10 points, 13 rebounds, 15 assists, five steals and two blocks in a Cougar win ver Loyola Marymount. It was the 10th triple-double of his career to add to his NCAA record and his fourth of the season. 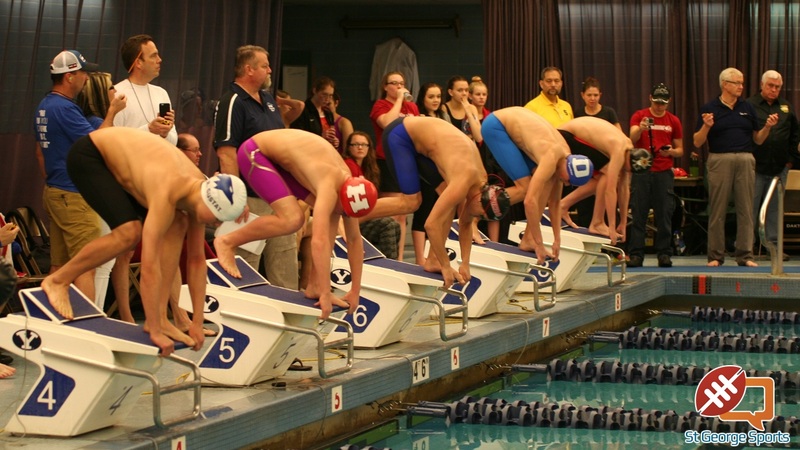 Cedar dominated the pool at the region swim meet, held at the Sand Hollow Aquatic Center last January. Led by Katelyn and Kristen Gross, the Lady Reds finished with 469 points while Desert Hills was second with 429 and Dixie was third with 398. Snow Canyon had 210, Pine View 159 and Hurricane 145. On the boys side, Cedar won with 485 points while Desert Hills had 398 and Snow Canyon had 279. Dixie finished with 227, Pine View with 210 and Hurricane with 202. It was a day of new beginnings, or perhaps a day full of rewards for hard work. Either way, it was a good day for many local high school football players Wednesday as they signed National Letters of Intent with various colleges and universities. 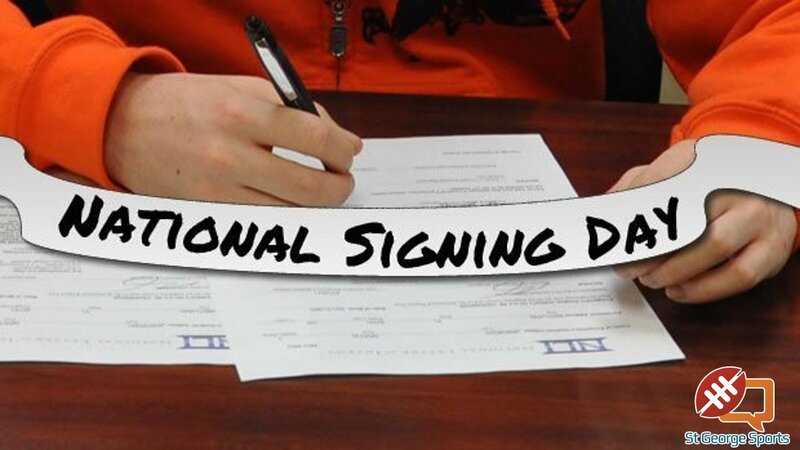 Some of the notable signees on the National Letter of Intent Day for football were Tre Miller of Dixie (Utah State), Desert Hills’ Justice Alo (Southern Utah) and Pine View’s Steve Bangerter (Dixie State). 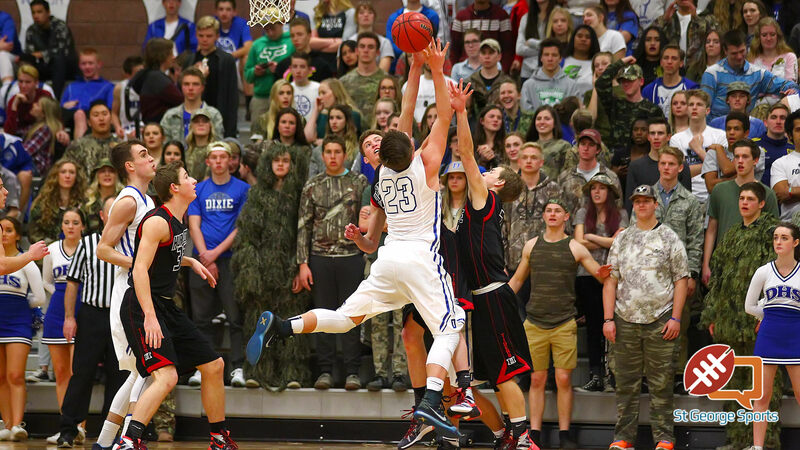 Dixie was all business in clinching Region 9’s top seed Friday night in a blowout of Hurricane. There was no party. No cutting down of the nets. Not even a chest-bump. The Flyers meant business. Dixie clinched the No. 1 seed and at least a tie for the region championship with the dominating win over the Tigers at The Hangar. Tyler Bennett had 21 points and a handful of assists and James Eardley and Nate Crockett scored 10 points each for Dixie. It was a foreshadowing of things to come for the Dixie basketball team in 2016. 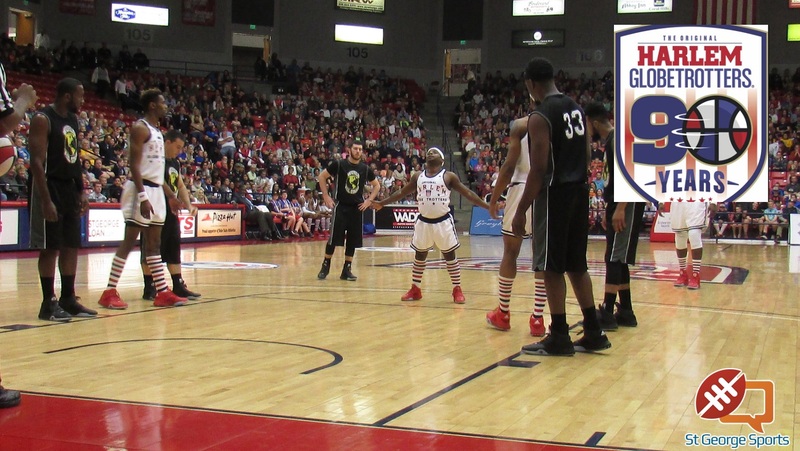 The world’s favorite basketball team entertained a packed house at Burns Arena and showed of the flair for hoops antics and comedy that only the Globetrotters can. Scooter Christensen and Big Easy Lofton kept the capacity crowd in stitches for 90 minutes. Other Globetrotters at Burns Arena were “Too Tall” Hall, who at 5-foot-2, is the shortest player in Globetrotter history, and “TNT” Maddox, the first woman to don the red, white and blue since 1993. The current coach was none other than Sweet Lou Dunbar. 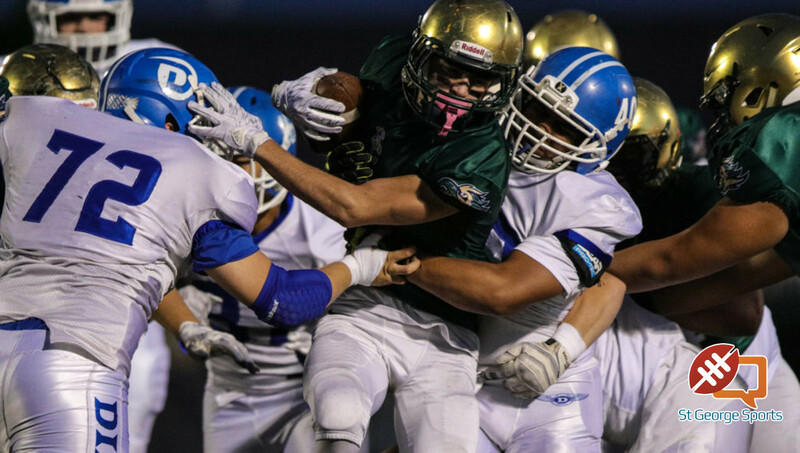 Snow Canyon returned to the top of the Region 9 mountain, clinching the league title at home with a win over third-place Desert Hills. The Lady Warriors were last region champs in 2011, a couple of years before any of the eight seniors on the team were even in high school. Led by Mada Mooring, Shaylee Reed, Nikenna Durante and Natalie Coulham, SC started itself on a path toward a state title with the clinching victory. Canyon View’s Nathan Wallace and Park City’s Lucas Hess shared male athlete of the meet honors as Saturday’s Class 3A swimming championships at BYU. 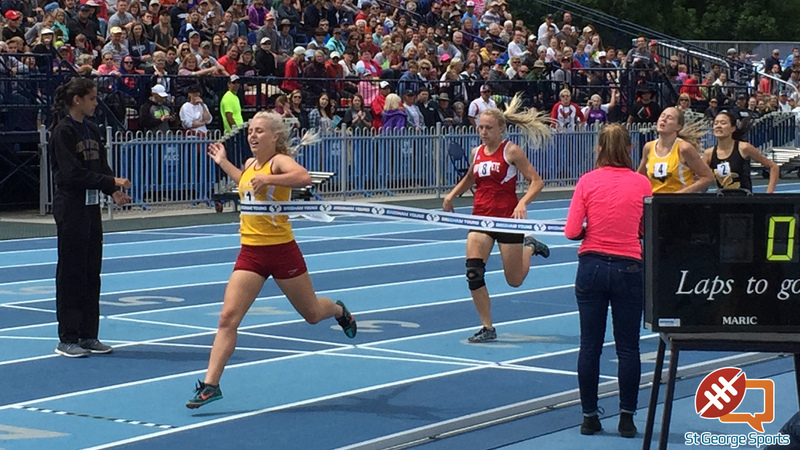 Wallace won two events and anchored the Falcons to silver medals in two relays. On Saturday he won the 100-yard freestyle in 46.55 seconds with teammate Alan Anderson finishing second in 47.88. They later teamed for a silver medal in the 400-yard freestyle relay. 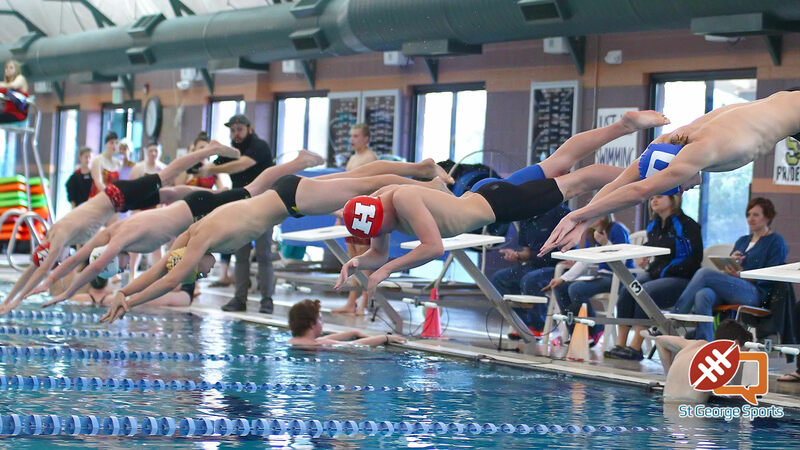 On Friday, Wallace won the 50-yard freestyle and the Falcons got silver in the 200-yard medley relay. Snow Canyon’s Kody Hafen had a history he wasn’t proud of at the state Class 3A wrestling tournament. “I’ve wrestled for 15 years and never taken first (in a state meet),” Hafen said after exorcising his personal demons on Saturday. Hafen defeated Juab’s Jayce Lind 6-4 to claim the 120-pound championship. 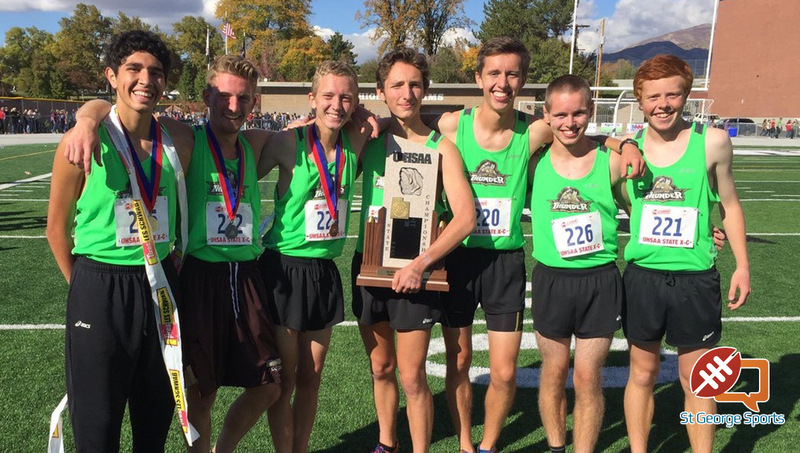 Hafen and Desert Hills’ Liam Williams didn’t choke this time, clinching their state titles at the 3A State Meet at Utah Valley University. Two wrestlers from Hurricane High School are being praised for prompt action during a medical emergency in Orem on Feb. 11. 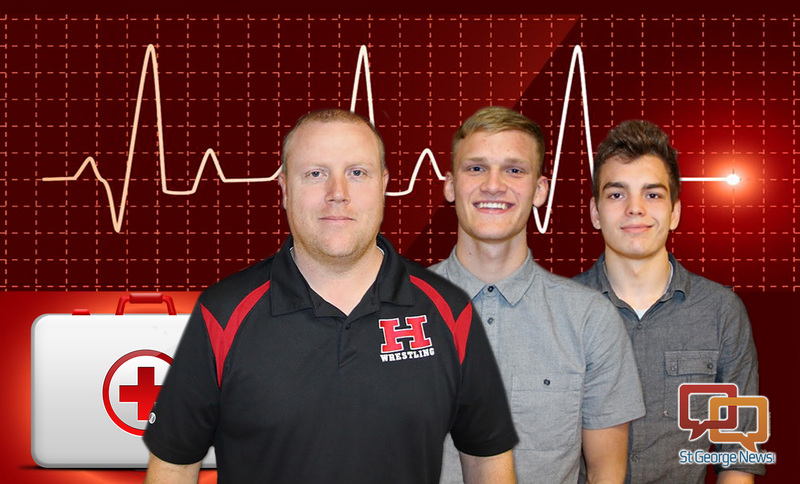 According to coach Ryan Christiansen, Allan Madsen and Devin English helped him perform CPR on a man experiencing a heart attack at the Comfort Inn where he and the Tiger wrestlers were staying ahead of the Class 3A wrestling tournament at Utah Valley University. Dixie State head coach Jon Judkins recorded his 200th victory as the Red Storm’s head coach Monday night in a 75-65 victory at Dominican University’s Conlan Center. 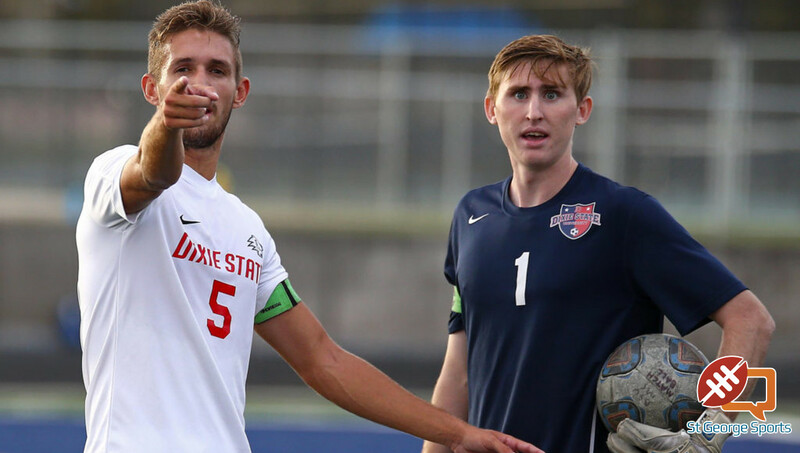 The victory could not have come at a more crucial time as Dixie State was fighting for positioning in the PacWest Tournament. Cedar’s Lady Reds led for about 27 of the 32 minutes in the 2016 3A Girls State Championship game at SUU’s Centrum Arena. But as we all know, it’s not who led the most, but who led last, and Snow Canyon emerged with a 58-54 victory to capture the 2016 state title. The Lady Warriors last won state in 2012, when the current class of seniors were in eighth grade and coach Dan Roden was just an assistant. Two moments in time dominated the conversation after Dixie captured the 2016 3A State Basketball title Saturday evening with a 65-57 victory over Juan Diego at SUU’s Centrum Arena. The first was some time in February of 1970, when Don Lay led Dixie to its last state title in boys basketball. The second was a bit more recent. The date was Feb. 28, 2015, a day that saw the stars align for Pine View in a 46-43 state-championship win over Dixie. Tyler Bennett, Richard Guymon, Malachi Otis and several other of Dixie’s current stars had to watch as the Panthers celebrated and cut down the nets at the Maverik Center. Although it is a painful memory, it served Dixie well for the last 364 days. A red-and-white Kahuku High School flag snapped in the breeze, framed by the green of the Snow Canyon High rugby pitch and with Red Mountain in the background as the Hawaiian team defeated the Warriors 31-14 in the final game of the Snow Canyon Invitational. “I think it’s one of the best in the country,” Snow Canyon coach Mike Puriri said of the tournament which featured Kahuku, Snow Canyon, United out of Alpine, Utah; Red Mountain from Mesa, Ariz.; Orcas from Thousand Oaks, Calif. and Olympus from Salt Lake City. 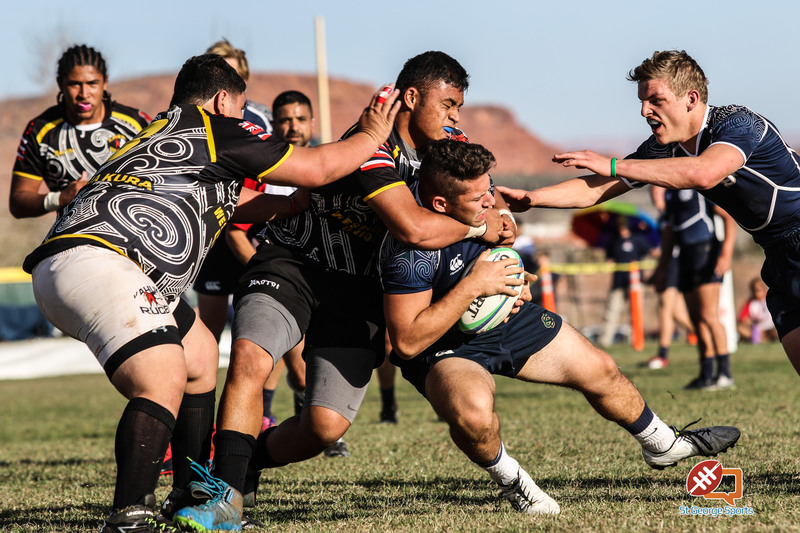 It was an incredible weekend of action at Southern Utah University with a pair of trophies heading back to St. George after Dixie’s boys championship and Snow Canyon’s girls championship. 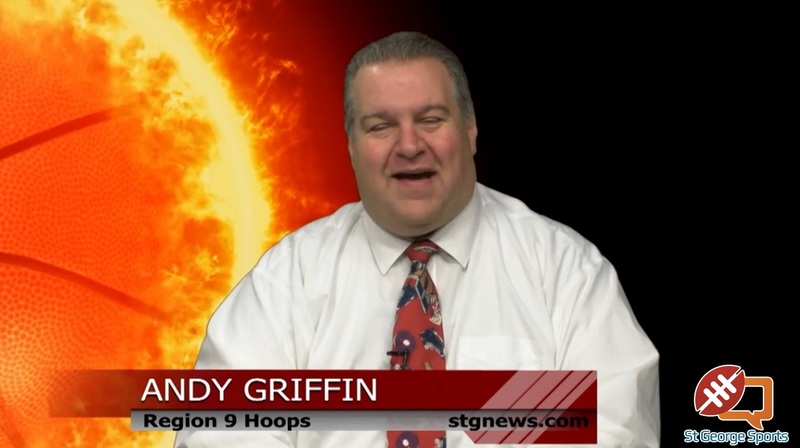 On this show, Andy Griffin has highlights, the inside scoop in statistics and, of course, our picture of the week. Also featured on the show: The All-Tournament team for the boys and girls and our pick for the 3A classification’s players of the year in both boys and girls basketball. And finally, we are excited to present the Dixie championship video filmed and produced by Adam Mathews Video. It’s four minutes of high-flying fun you won’t want to miss. 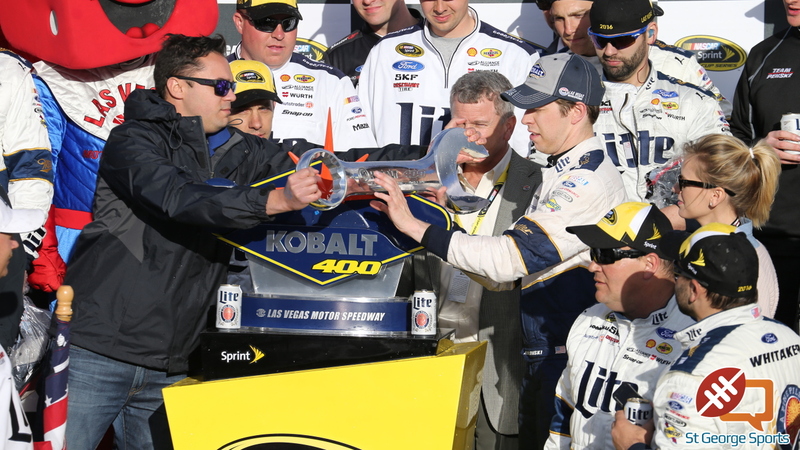 St. George News specialty photographer Rick Johnson spent the weekend at the Las Vegas Motor Speedway for NASCAR’s Kobolt 400 and adjoining events. He was able to send us these excellent photos. Dixie didn’t play its best baseball and it certainly wasn’t pretty Wednesday night, but the Flyers gritted out a 6-1 win over Canyon View in the first official game played at the new Flyer Field. 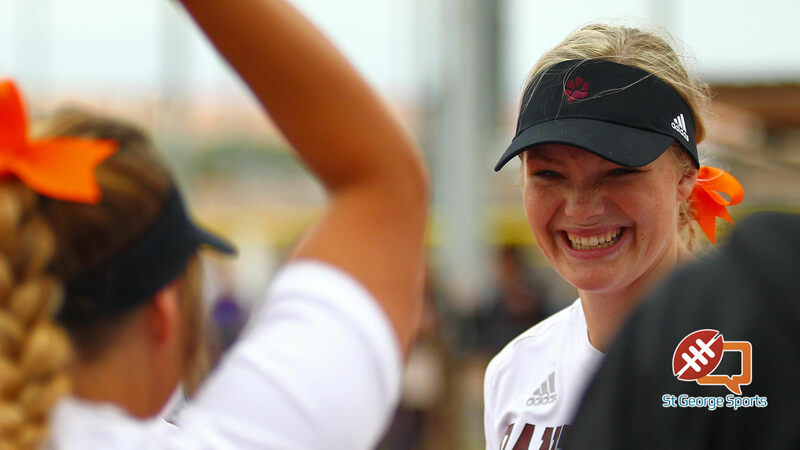 Dixie drew 14 walks off of three Falcons pitchers, but also left 13 runners on base in the five-run victory. But the numbers don’t mean much to head coach Danny Ipson, who was tickled that his team could mark the momentous occasion with a victory. Leave the buzzer-beaters and heart-stoppers to the other guys. For Gonzaga, these are the March Mismatches. The Bulldogs, looking like something much different than an 11 seed, rolled over No. 3 Utah, 82-59 behind 22 points from Eric McClellan and a 19-point, 10-rebound effort from Domantas Sabonis. This was a wire-to-wire effort even more impressive than their 16-point win over Seton Hall in the first round. “We played as good as probably we’ve played all year, on what is the biggest stage,” coach Mark Few said. Despite a strong second half and three players scoring in double digits, No. 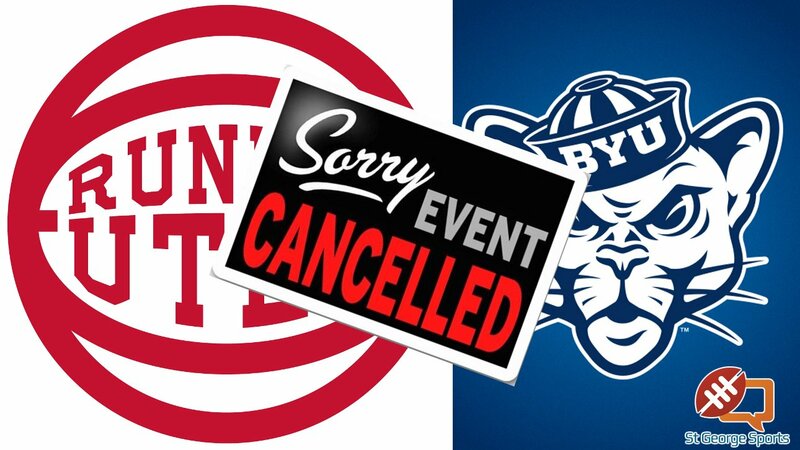 2 seed BYU basketball’s season ended after falling 72-70 to No. 1 Valparaiso in the semifinals of the National Invitational Tournament at Madison Square Garden. Cougar senior guard Chase Fischer had his 3-point shot attempt from about 28-feet out blocked as time expired to help the Crusaders hold on for the win. BYU ends the 2015-16 season with a 26-11 record (13-5 West Coast Conference), while Valparaiso improves to 30-6 (16-2 Horizon League) while advancing to the NIT finals against the winner of San Diego State and George Washington. The two teams combined for 38 turnovers, with the Cougars tallying 18. BYU was held to 38 percent shooting to Valparaiso’s 43 percent. 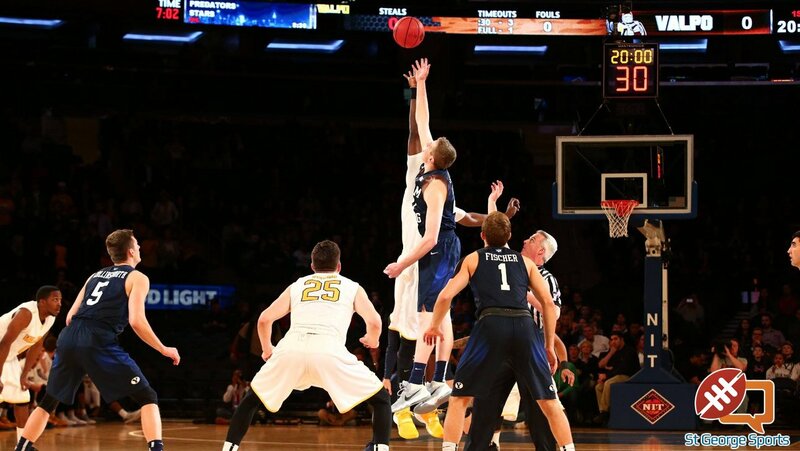 It was the final collegiate game for BYU record-setting point guard Kyle Collinsworth. It didn’t come as a surprise to Jakob Poeltl’s coaches or teammates, and shouldn’t come as a surprise to anyone else who has been paying even the slightest bit of attention to college basketball, but it is official, Poeltl is going to forego his last two years of college and enter the NBA draft. The Red Storm is dead. The Trailblazers have arrived. As of late Monday afternoon, Dixie State University’s former athletic identity and mascot are extinct. 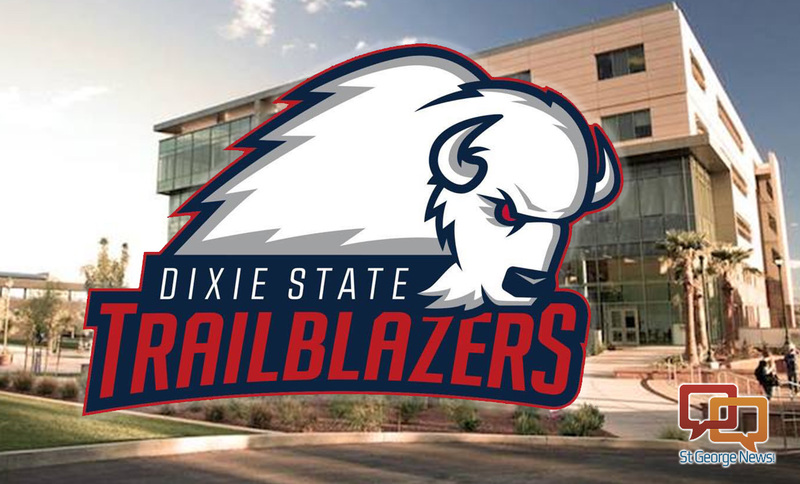 After a 17-month process that pulled 10 years of research together and included feedback from various focus groups, Dixie State officials finally settled on an identity they felt reflected the heart, history and authenticity of the community and the institution. Thee Trailblazers were one of three finalists presented to small focus groups after the original six options were whittled down though an online survey held in December. The other potential identities were the Raptors and Sun Warriors. 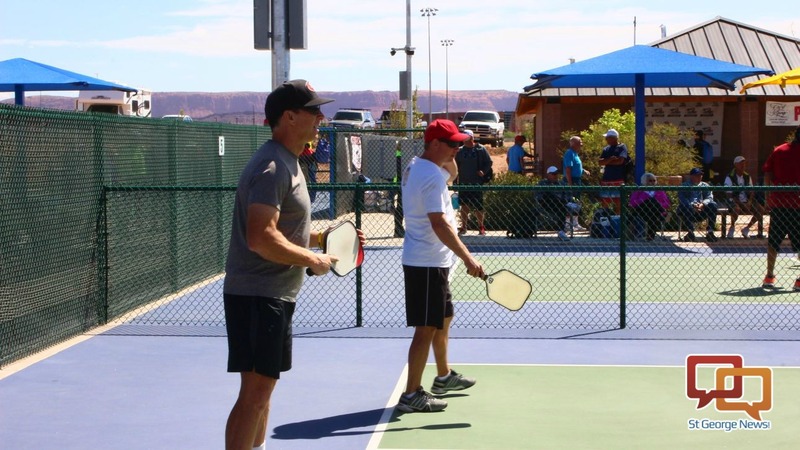 The USA Pickleball Association West Regional Tournament came to Utah for the first time on Friday and Saturday, with over 400 players from across the western United States descending on the Little Valley Pickleball courts in St. George to vie for a shot at the tournament championship. The sound of paddles connecting with plastic balls filled the air around the Little Valley Sports Complex on a warm Saturday morning as hundreds of players young, old and in between competed singly or in pairs for a shot at a medal. Family members and spectators watched from lawn chairs and bleachers. Bob Klarich, co-director of the tournament, said not only is the regional tournament being held at the Little Valley courts this year, but for the next three years as well. It was not quite David vs. Goliath, but maybe David vs. Goliath’s smaller brother. 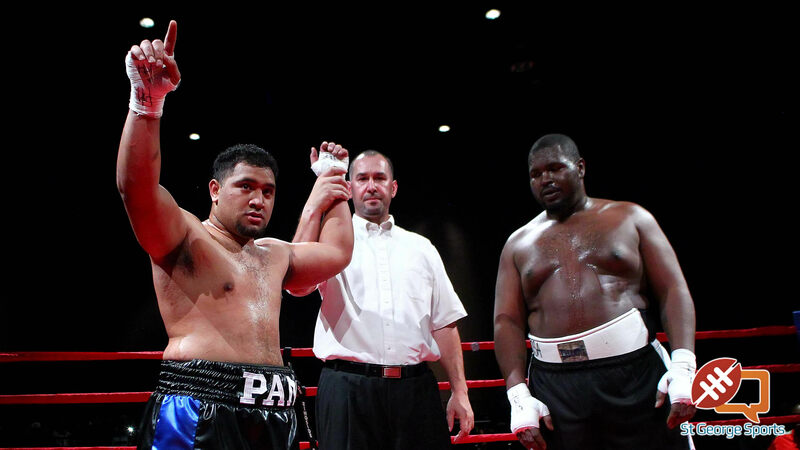 Local sports star Pano Tiatia went against “Big John” Orr in his professional boxing debut and came out on top by unanimous decision with the score on all three cards 40-36 in the four round bout. 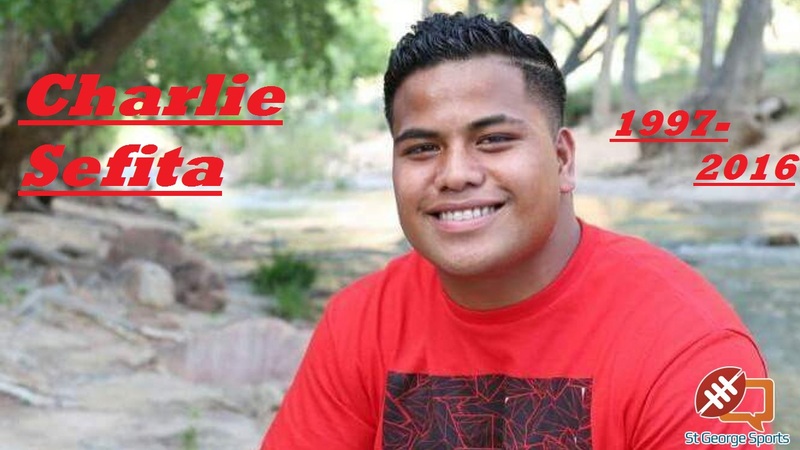 Charlie Sefita was so much more than one play. But the young man, who died late Saturday night from complications due to pneumonia and a weakened heart, will forever be remembered for that one play. 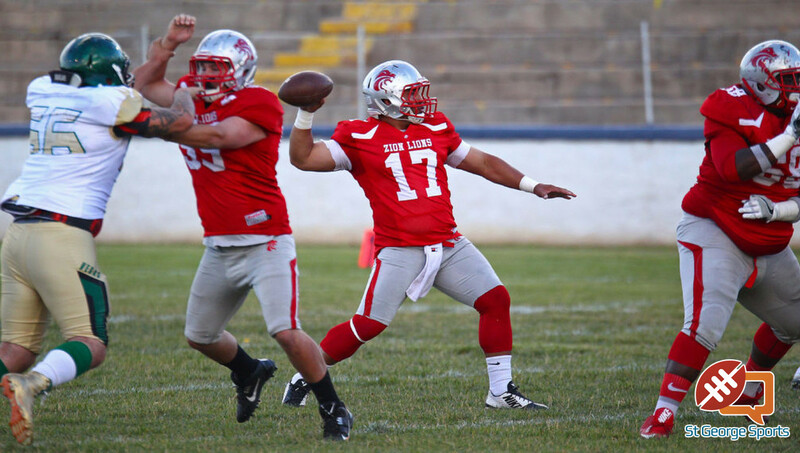 Sefita, a first-team all-state linebacker in 2014 for the Hurricane Tigers, made a play many fans will never forget. It was the 2014 3AA State Semifinals at Rice Eccles Stadium in Salt Lake City. Hurricane held a slim 17-14 lead with under two minutes to play, but Desert Hills had driven the length of the field and had a first-and-goal at the 7-yard line. Someone had to make a play or the game, and the season, was lost. Thunder quarterback Nick Warmsley rolled right on an option play, but Sefita read the play and blazed a beeline to Warmsley, lowering his head just in time to knock the ball 10 feet in the air. Tyson Yardley plucked the loose pigskin out of the sky to stop the scoring threat. Hurricane then ran out the remaining time to clinch a spot in the 3AA championship game. He said he’s never seen the movie, but there’s a pretty good chance Pine View pitcher Connor Clark will be viewing “Major League” on Netflix real soon. Doing his best impersonation of Ricky “Wild Thing” Vaughn, Clark struck out three straight batters with the bases loaded in the bottom of the seventh to help the Panthers beat Desert Hills 2-1 and capture the 2016 Region 9 baseball crown. PA announcer and event manager Burke Staheli had clearly seen the movie as the Panther Field sound system blared “Wild Thing” as Clark went through his warm-ups. Clark’s first warm-up pitch echoed a loud pop in catcher Ryke Erickson’s glove and it was clear the right-hander was bringing gas into the situation. 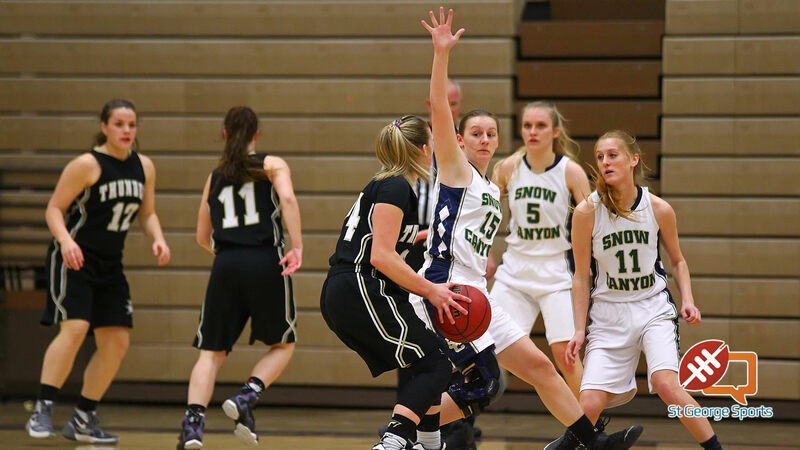 It may have been a little bit more difficult this year, but Snow Canyon is Region 9 champion once again after a road win Friday afternoon in Cedar City. Snow Canyon benefited from two home runs by Mada Mooring that propelled them to a two-run win and the Region 9 championship. A Cedar victory would have had the two teams tied at the top. With the loss, Cedar drops into a tie with Desert Hills for second place. Snow Canyon finished with a region record of 9-1, with the only loss coming at the hands of Desert Hills, 1-0 in extra innings. Battling rain, wind and cool temperatures is no big deal for Lionel Sanders and Heather Wurtele. After all, they’re Canadians. 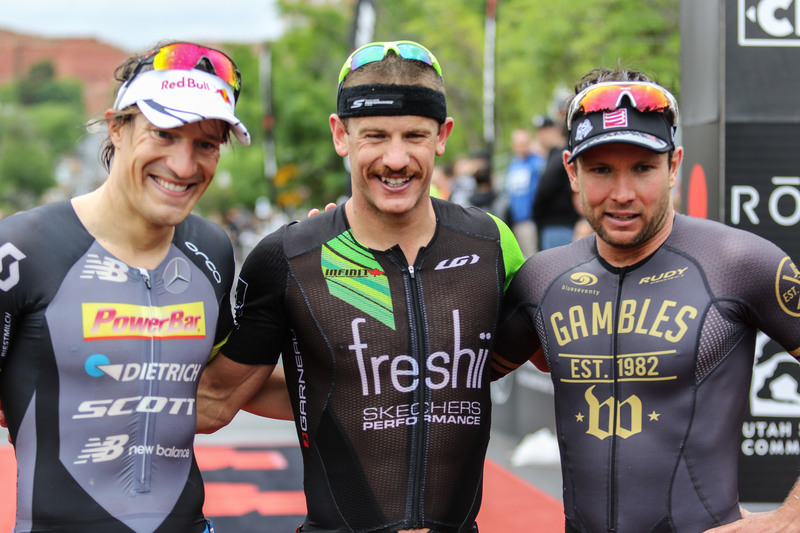 Sanders emerged as the pro men’s winner for the first time in St. George and Wurtele captured her second straight Ironman 70.3 in St. George, earning them both the North American Pro Championship title. On the pro women’s side, Wurtele, from Kelowna, British Columbia, finished in a time of 4:16:48. Holly Lawrence, from Great Britain, was the second women’s finisher, coming in at 4:18:04. Meredith Kessler, a past winner of the race, placed third with a time of 4:22:02. Kessler is from San Francisco. Just a few inches here and there in the final minutes of the match kept the Snow Canyon Warriors from equalizing against undefeated Juan Diego, which prevailed 1-0 and won the 3A State Championship Saturday at Alta High School. 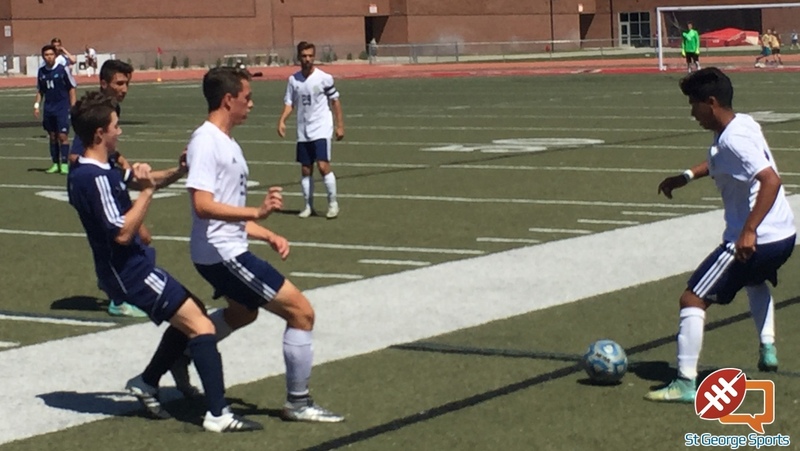 Juan Diego, which took the lead late in the first half via Brandon Sands’ 30-yard free kick, held off Snow Canyon’s second half full-field press and a furious series of attacks on goal in the closing minutes to prevail. Juan Diego’s sophomore goalkeeper, Martin Kelly, denied Snow Canyon’s best scoring opportunity, a beautiful header from Parker Jenkins in final minute, to seal the Soaring Eagle win. For the fifth-straight season, the No. 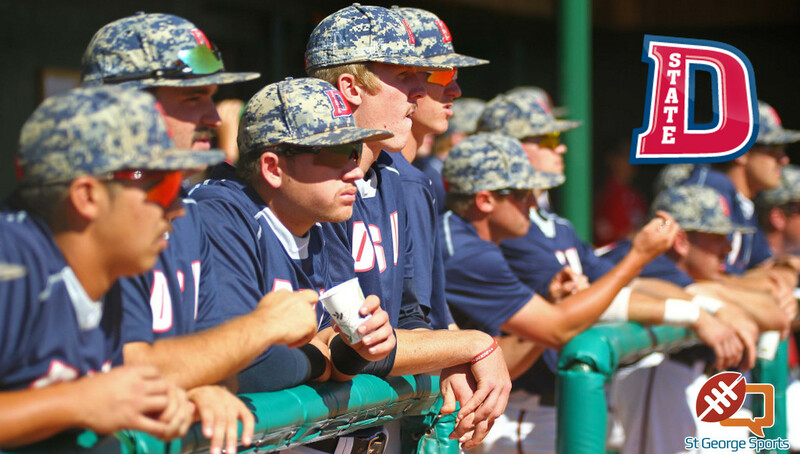 10-ranked Dixie State University baseball team earned an NCAA Division II Baseball Tournament berth. The Trailblazers (38-12) were awarded the West Region’s No. 2 seed in the six-team regional and faced No. 5 seed Cal State Monterey Bay (33-19) Thursday (time TBA) in Riverside, Calif. All games will be played at James W. Totman Stadium on the campus of the host school and top-seeded California Baptist University. Dixie State and CBU (39-11) are the lone Pacific West Conference representatives in this year’s West Regional field, while the other four schools hail from the California Collegiate Athletic Association (CCAA). CBU will play No. 6 seed Cal State East Bay (33-20) Thursday (time TBA), while No. 3 seed and defending West Region champion Cal Poly Pomona (35-17) will play No. 4 seed Chico State (32-20) Thursday. Desert Hills captured its seventh straight girls golf championship and Dixie junior Gracie Richens came as the individual state 3A champion as the two-day event concluded Thursday at Soldier Hollow Golf Course in Midway. 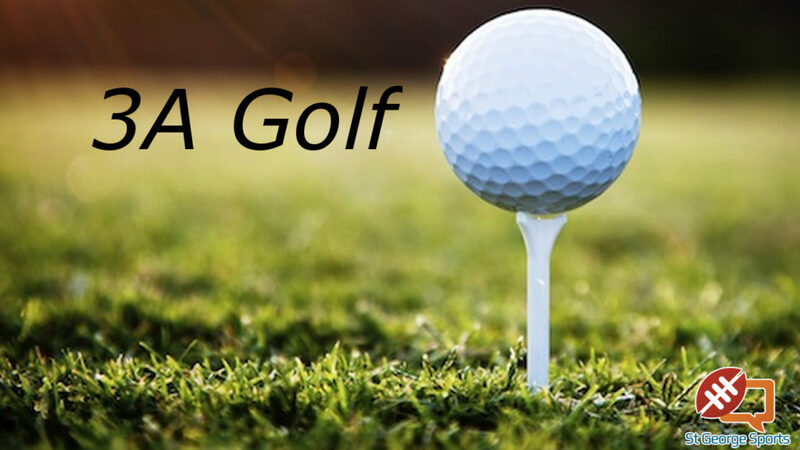 The Lady Thunder made up a three-point deficit (modified Stableford scoring) with a strong finish, though the outcome was still in doubt until the final scores were tabulated and posted. D-Hills finished with a score of 610, six points better than second-place Park City. Richens, meanwhile, started strong on Thursday and never trailed, though Desert Hills senior Kyla Smith stayed close throughout. Richens edged Smith 174-172, with Park City’s Saylor Rabe coming in third at 163 and Pine View’s Taylor Bandley placing fourth with a 162. Bandley was second a year ago, losing in a playoff to three-time champ Katie Perkins. Scoring in all but one event and heavily in two distance events, Desert Hills’ boys again raced away with the state Class 3A track and field championship. As the defending champions did a year ago, they nearly doubled up their nearest competitor. The Thunder finished with 121 points to 67 for Juab, 46 for Richfield, 42 for Logan and 38 for Cedar. Twenty-one teams scored. Jaiden Melendrez led the Thunder as he won the 1600 on Friday and the 3200 on Saturday. Bryson King, Joshua Thatcher and Sage Discote were third, fourth and fifth in the 1600. They were fifth, seventh and eighth in the 3200. It is the fourth consecutive state title for the D-Hills boys. Cedar City’s girls used a slightly different formula, but with the same result, to outdistance Desert Hills. The Lady Reds finished with 135 points to 109 for the Thunder, 61 for Stansbury, 49 for Dixie and 47 for Richfield. The Pine View pitching staff was the best in 3A all season long. Saturday night, the Panthers rode that pitching staff to a second straight state 3A championship at Gates Field with a 4-3 win over the Cedar Redmen. Pine View head coach Troy Wall rolled the dice a little bit, starting Cole Green instead of hard-throwers Dakota Donovan and Connor Clark. 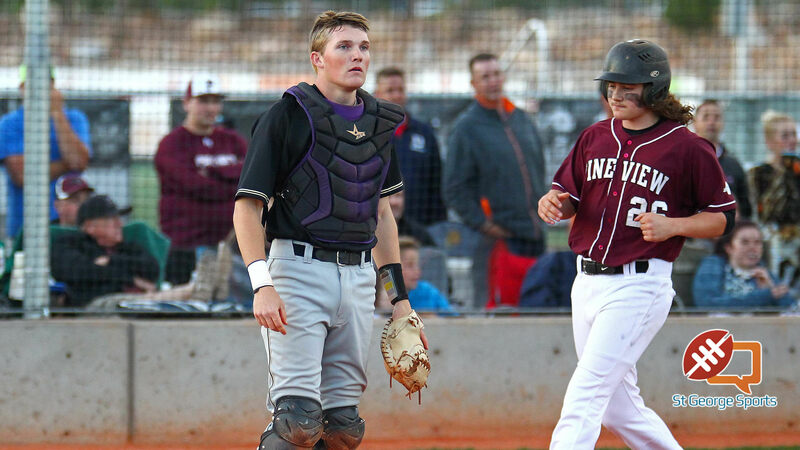 But Green held the previously red-hot Cedar bats down and Donovan finished the job with two hitless innings as Pine View beat Cedar for the second straight year in the state championship game. In the end, it was two Region 9 teams once again squaring off for the state title, and Pine View bringing home the gold trophy. 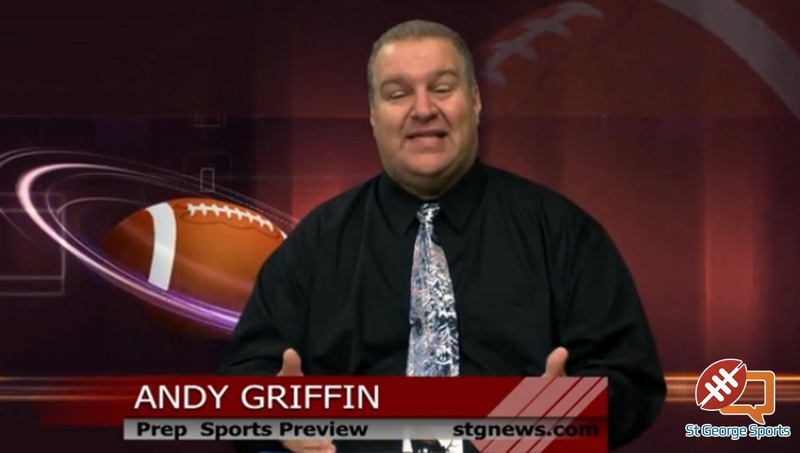 On the show today, Andy Griffin brings you highlights from the state playoffs, plus we go Inside the Numbers for Pine View’s championship run and we talk on set with Panther head coach Troy Wall. Former Snow Canyon and Louisiana Lafayette pitcher Eric Carter was drafted by the St. Louis Cardinals. | Photo courtesy ULL Ragin’ Cajuns Athletics. It was just another routine trip to the grocery store for Eric Carter and his wife Jessica. And then his phone went crazy. 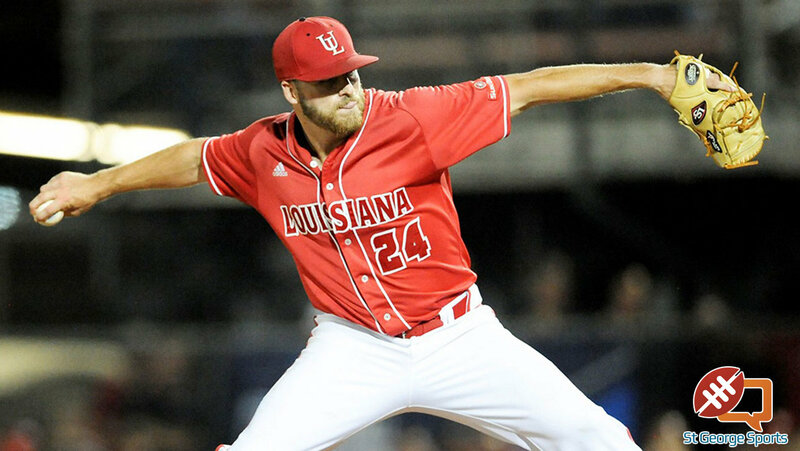 Carter, the former Snow Canyon Warrior pitcher who just graduated from the University of Louisiana-Lafayette, had just been drafted by the St. Louis Cardinals in Major League Baseball’s 26th round. The Zion Lions dug themselves a hole that turned out to be 10 yards too deep. Misi Tupe’s pass into the corner of the end zone – from the 10-yard line – was knocked away and, for the third straight year, the Wasatch Revolution mobbed the field in celebration of their Rocky Mountain Football League championship. The 21-15 victory ended up as a nailbiter, though the Rev had led the entire game. Wasatch held a 21-3 lead with under six minutes left in the game. But Tupe led the Lions to two straight scores and an onside kick got Tupe and his offensive teammates the ball with one last chance. Snow Canyon’s Little League softball team went further than any other softball team in southern Utah had ever gone. 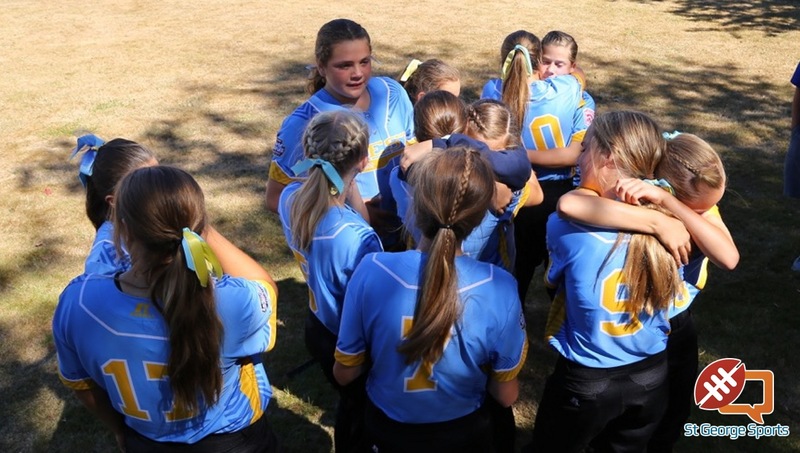 One win away from a matchup with the defending national champions on national television, Snow Canyon Little League had big plans heading into Monday’s quarterfinal game against New Jersey. But the Snow Canyon girls never quite woke up Monday morning and took a hard 10-0 defeat at the hands of the team representing the East Region of the USA. 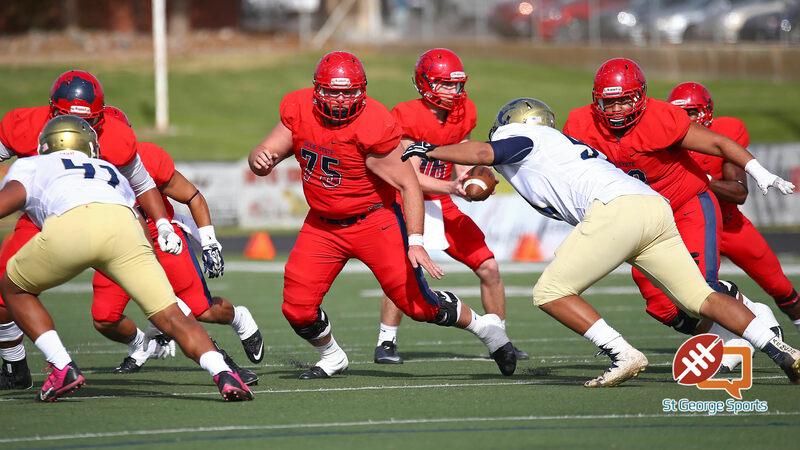 Led by junior safety Colton Olson, Dixie State showed off a stout defense Thursday night in the Trailblazers’ season-opening 21-14 win over New Mexico Highlands University at Legend Solar Stadium. It started off the head coaching career of Shay McClure right for DSU, giving him a win in his first try. Dixie State unveiled its new mascot, Brooks the Bison, at the game as well. The mascot nearly completes the rebranding of the University from the unpopular Red Storm to the new Trailblazer identity. On the ultimate drive of the night, Taysom Hill, Jamaal Williams and the BYU offense did what they were supposed to do. Now it was up to Jake Oldroyd. The 18-year old from famed Southlake (Tex.) 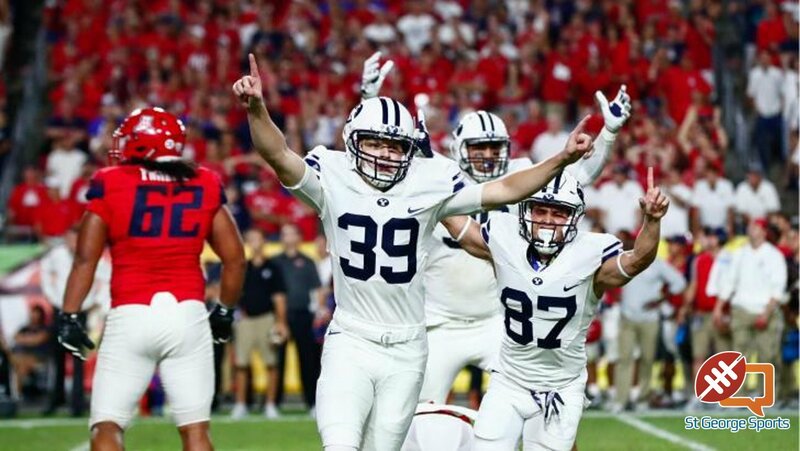 Carroll High School, a true freshman who had never even attempted a collegiate kick of any kind, drilled a 33-yard field goal with four seconds left in the game to lift BYU to an 18-16 victory over the Arizona Wildcats at the University of Phoenix Stadium in the Cactus Kickoff. BYU coach Kalani Sitake rolled the dice at Rice-Eccles Stadium and the Utah defense made sure they turned up snake-eyes. Utah beat BYU 20-19 after Sitake sent his offense out onto the field for a two-point conversion and the win with 18 seconds remaining. Cougar quarterback Taysom Hill, who had just scored on a 7-yard scramble, took the conversion snap and tried a draw up the middle. But the Utes were waiting for the run and stuffed Hill 3-yards short of the goal line. The stop sparked a celebration for Utah, which captured its sixth straight victory over BYU in the intense “Holy War” rivalry. 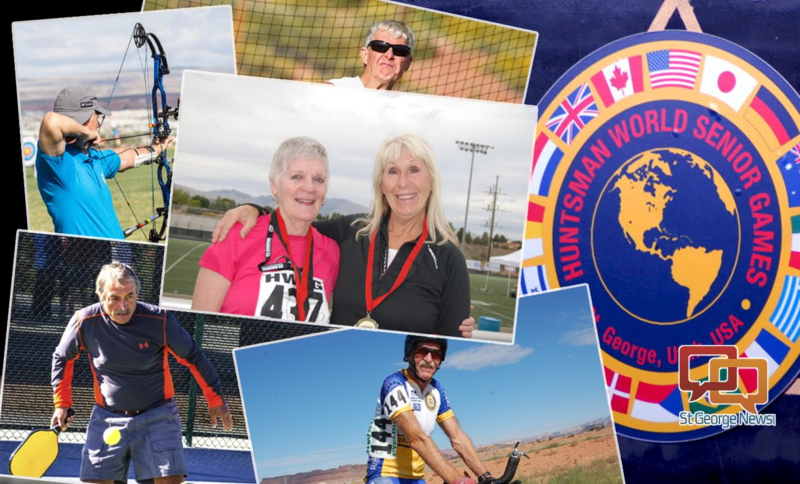 The Huntsman World Senior Games begin Monday, Oct. 3, and this year the games are celebrating 30 years of competition for athletes age 50 or older. The Senior Games have come a long way since that first year in 1987 when St. George welcomed a few hundred athletes competing in a handful of sports. From those humble beginnings, the Games have grown into the world’s largest annual multi-sport event for men and women age 50 and better. The Games take place each October and are open to athletes of all skill levels. The 2016 games will welcome around 11,000 athletes to St. George, about the same number of athletes that competed in the Rio Olympics. All 50 of the United States of America will be represented and athletes from more than 34 different countries (a new record for the Games) will take part. Since 1987, the Games have hosted 77 different countries at the event. 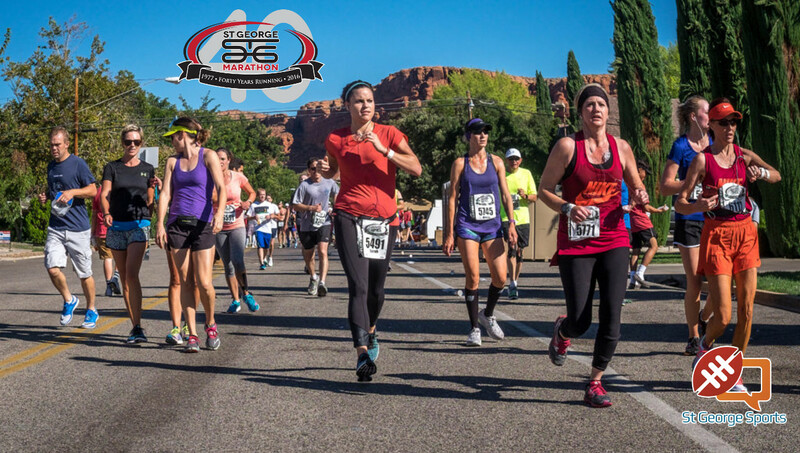 The St. George Marathon turned 40-years-old this year and the old girl, well, she’s doing just fine. Riley Cook of South Weber, Utah, won the men’s event, missing the all-time record for the St. George Marathon by just 13 seconds. He finished with a time of 2:16:09. The SGM record is 2:15:56, set by this year’s second-place finisher, Bryant Jensen. For the women, on old friend of the race returned triumphantly as Rosy Lee broke the tape for the win. She came in at 2:40:45, 14 seconds ahead of second-place finisher Lindsay Nelson. Lee won the race in 2013, but took the last two years off. At age 40, she said this was, perhaps, her last marathon. 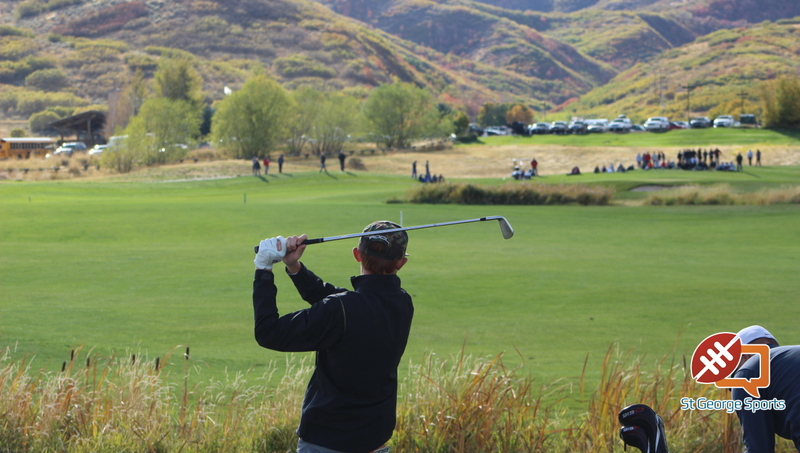 Pine View’s Noah Schone shot five birdies in his last six holes to force a tie-breaking playoff and came within a literal inch of forcing a second tie-breaking playoff hole before conceding the state championship to Juan Diego’s Michael Walters in the 3A state golf tournament Thursday at Soldier Hollow Golf Course. Park City ran away with the team title, defeating second-place Logan by 42 strokes and third-place Pine View by 43 strokes. The Miners shot a two-day team score of 569. Schone, who recorded a 140 for the two-day tourney, was four below par for the tournament and tied with Juan Diego’s Michael Walters (140) and Park City’s Zane Schemmer (140) during tournament play. It was a “Wow!” kind of night in the 3AA South Region. Desert Hills had Pine View on the ropes, but let the Panthers rally to tie it, before the Thunder eventually ran away with the win. Dixie and Snow Canyon staged a shootout – for half a game. Then the Flyers defense and run game took over. And Cedar finally got its first region win – and the Redmen did it without star quarterback Mason Fakahua. 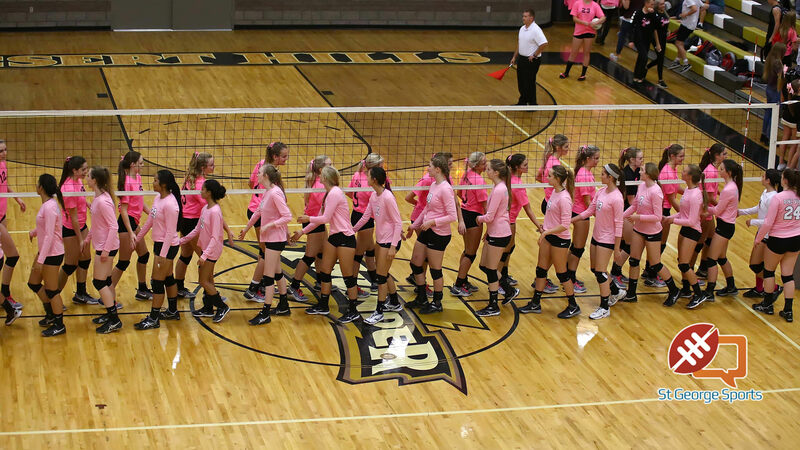 Desert Hills continued its dominance in Region 9 with a four-set win at home against Pine View Tuesday night. The victory officially clinches the Region 9 championship for the Lady Thunder, who are a perfect 9-0 in region play. Desert Hills dropped only its second set in region play, but still brought home the win against the visiting Lady Panthers 19-25, 25-9, 25-15, 25-14. Jaiden Melendrez and Spencer Ford finished first and second to lead the Desert Hills boys cross country team to its fourth straight 3A team title Wednesday at Sugarhouse Park. For the boys, Melendrez finished with a time of 15:27.1, shaving off more than 30 seconds from his third-place time from last year. And he needed almost every one of those seconds to edge teammate Ford, who recorded a 15:30.4. Bailey Brinkerhoff won the individual title on the girls side, but it was Pine View that took the team title, led by sophomore Rylee Holt and freshman Jessica Hill. 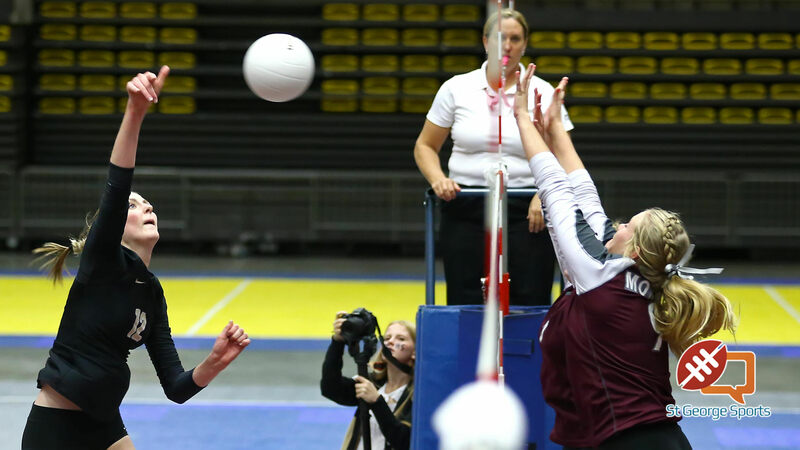 Experience and crafty defense were key Thursday evening as Morgan frustrated Region 9 champ Desert Hills and came away with its second straight 3A volleyball championship at the UCCU Center at Utah Valley University. The Lady Trojans swept the championship away with a decisive 25-15, 28-26, 25-21 victory. It was clear that experience on the big stage was a huge factor. Dante Pettis returned a punt 58 yards for a touchdown with 3:25 left and No. 4 Washington held off No. 17 Utah 31-24 on Saturday to remain undefeated. After Utah tied it at 24 with 9:07 left, Washington (8-0, 5-0 Pac-12) pinned the Utes on their own 1 on quarterback Jake Browning’s pooch punt. The Utes (7-2, 4-2) went three-and-out and punted to Pettis, who ran parallel toward the far sideline, broke a tackle and outran everyone else. Replays in the stadium and on television showed two or three apparent illegal blocks on the return, but no flags were thrown. The Dixie State men’s soccer team is going to the NCAA Division II championships for the first time in program history. The players and coaches gathered on campus for the NCAA Tournament pairings show on Monday night. There was much cause for celebration when it was announced the TrailBlazers will travel to San Diego and will play their first game this Friday against Western Washington. The 3AA South Highlight Show, brought to you by Revere Health, brings you all the wild plays from the Pine View win over Tooele and the Dixie victory over Bear River. Plus, we get to see how thoroughly dominant the Desert Hills Thunder were against Ridgeline and we look inside the number of all the games, including Stansbury’s blowout of Park City. For the second straight week, Desert Hills was nearly unstoppable on offense and this time, it has the Thunder punching their ticket into the state championship. Desert Hills racked up 498 yards of offense and averaged 9.1 yards per play in rolling to a 49-14 win over Stansbury in the 3AA Semifinals at Rice-Eccles Stadium. With a dynamic running back, a play-making slotback and a pinpoint quarterback, it seems there is no stopping the Pine View offense lately. 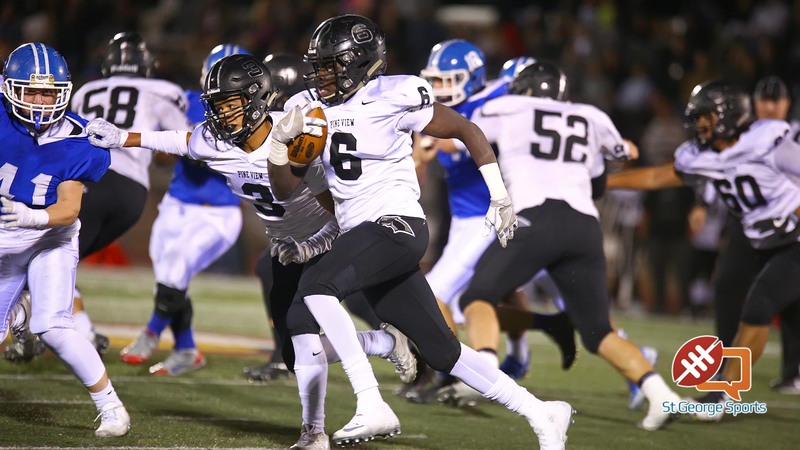 The Panthers racked up more than 500 yards and overcame a 14-0 deficit to beat Dixie 35-14 and earn their way into next week’s 3AA state championship game. 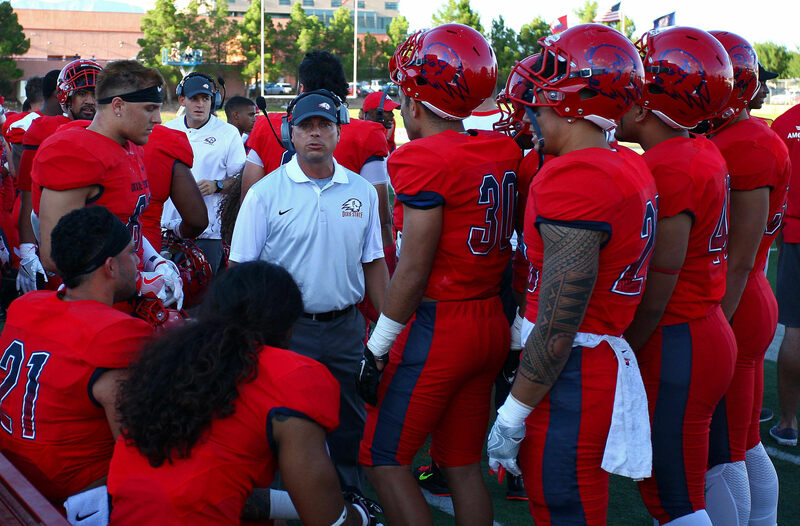 Dixie State reached another milestone with its final football game of the season, a tight 16-14 win over Fort Lewis. The win gave the Trailblazers their first winning season, at 6-5, since becoming a four-year institution. As a junior college program, Dixie dominated the football scene, usually finishing in the top 10 in the national rankings. Since the change, the football program has hit tough times, losing support along the way. That changed this season. 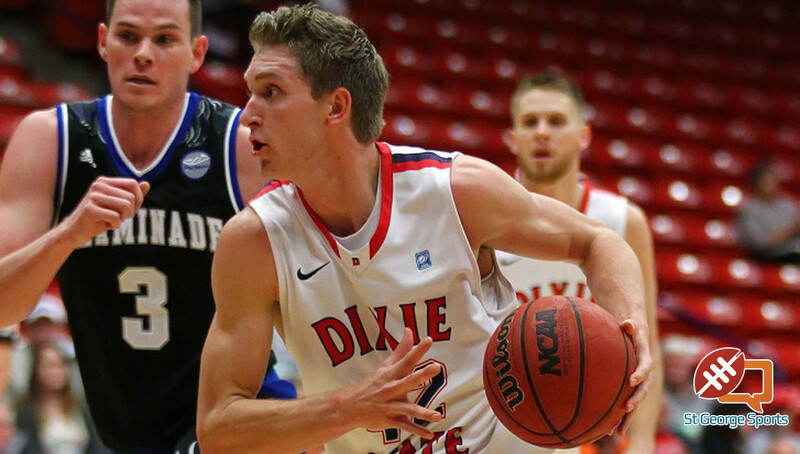 Switching conferences to the more competitive RMAC, many thought that Dixie State would finish at or near the bottom. Picked in the preseason to finish ninth out of 11 teams, the Trailblazers beat six conference opponents and finished tied for fifth. The 3AA South Highlight Show, brought to you by Revere Health, shows how well the two offenses are playing for the Desert Hills Thunder and the Pine View Panthers in their big wins in the semifinals. 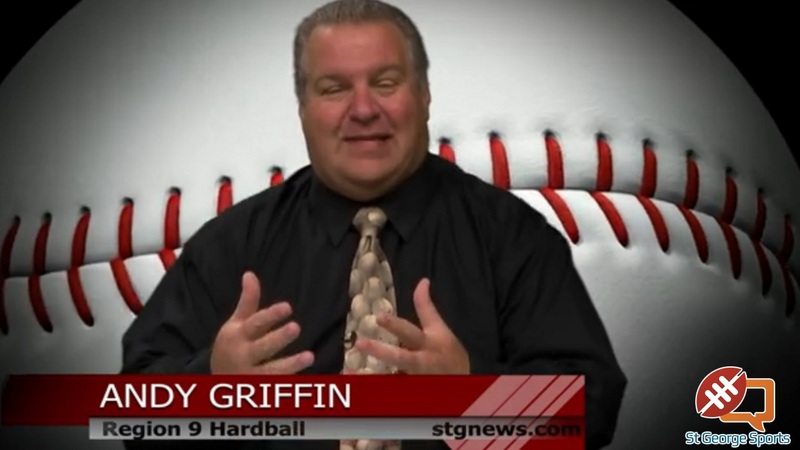 Andy Griffin had the highlights as two southern Utah teams made it to the state championship game once again. Who could ask for anything better than the state championship coming down to one play? 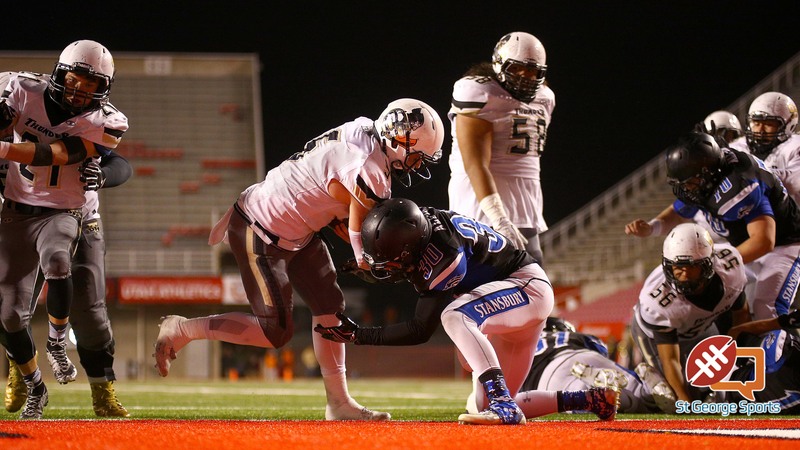 Desert Hills scored a touchdown on the last play of the game and Logan Callister added the extra point as the Thunder stunned rival Pine View 28-27 to capture the 2016 3AA state championship at Rice-Eccles Stadium. Quinn Kiser improvised on a play that was supposed to be a dive run to Marco Jordan, rolling away from trouble and then shot-putting a last-gasp pass to wide receiver Gavin Young as the clock rolled down to 0:00. The goal for No. 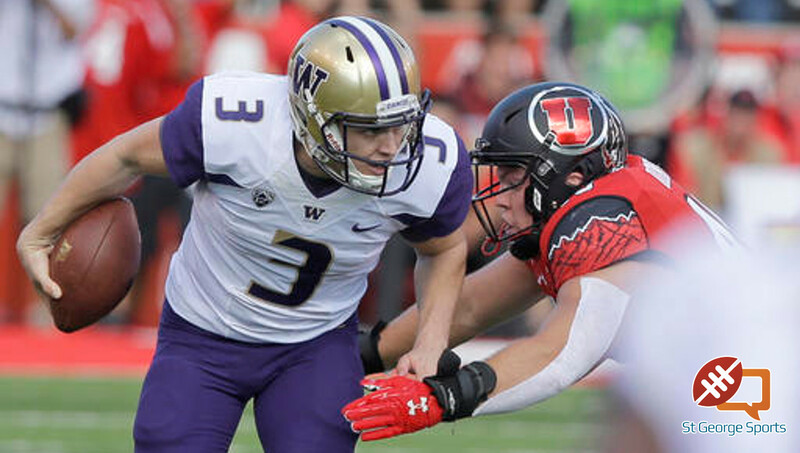 11 Utah was clear this season — win the Pac-12 South Division. The Utes have trended upward since joining the league in 2011, but have yet to play in the championship game. Their hopes of doing so this season ended Saturday. 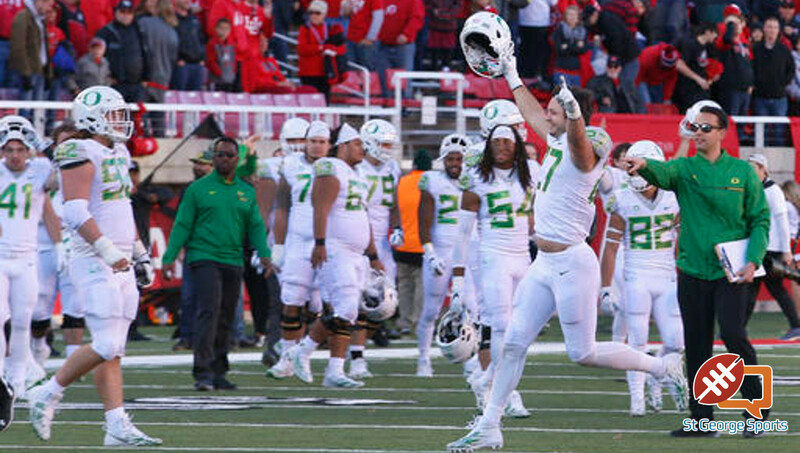 Justin Herbert hit Darren Carrington for a 17-yard touchdown pass with two seconds remaining to give Oregon a 30-28 upset victory over the Utes. 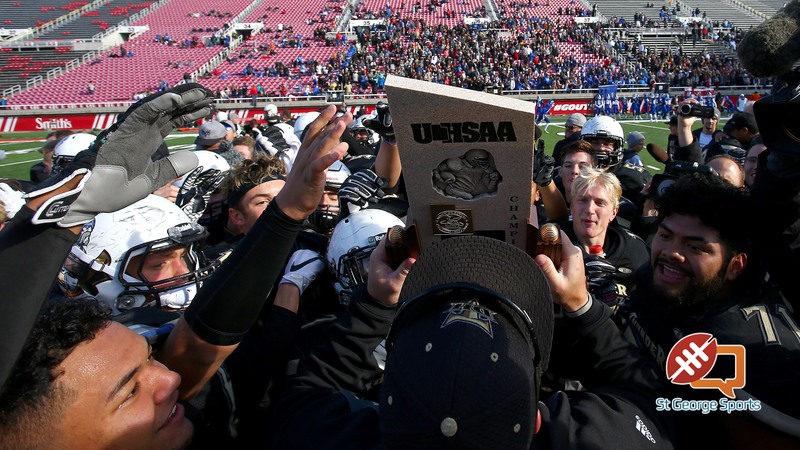 With the state championship on the line, it all came down to one play, with 1-yard the difference in deciding which team, Pine View or Desert Hills, would carry home that state championship trophy. Today’s 3AA South Highlight Show, brought to you by Revere Health, will let you relive all the important plays from Friday’s epic instant classic of a championship game. Ashley Beckstrand made what has long been expected official today. 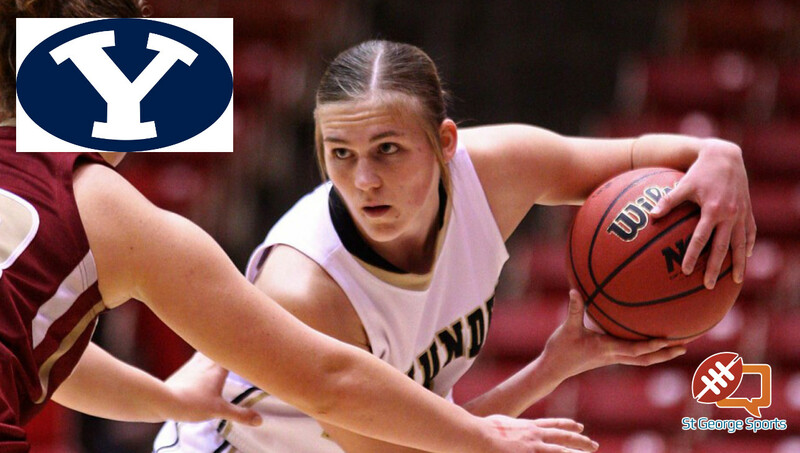 She will be playing for the Brigham Young University Cougars next year. Beckstrand was introduced by her coach, Ron Denos, who said he has loved coaching her from day one. A former BYU player got to stick it to his old team Saturday afternoon. Isaac Neilson scored 26 points and Utah Valley University made 18 3-pointers as the Wolverines won their first game ever in the Marriott Center 114-101 over the Cougars. Utah Valley made 18 of 37 3-pointers and took control of the game with a 15-0 run midway through the first half. 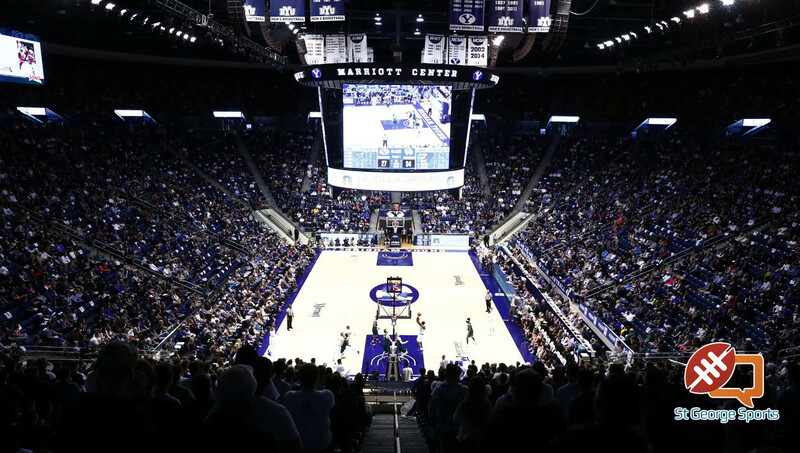 BYU rallied and led 52-51 in the closing seconds of the half, but UVU’s Brandon Randolph banked in a 35-foot 3-pointer at the buzzer and the Wolverines would not trail again. 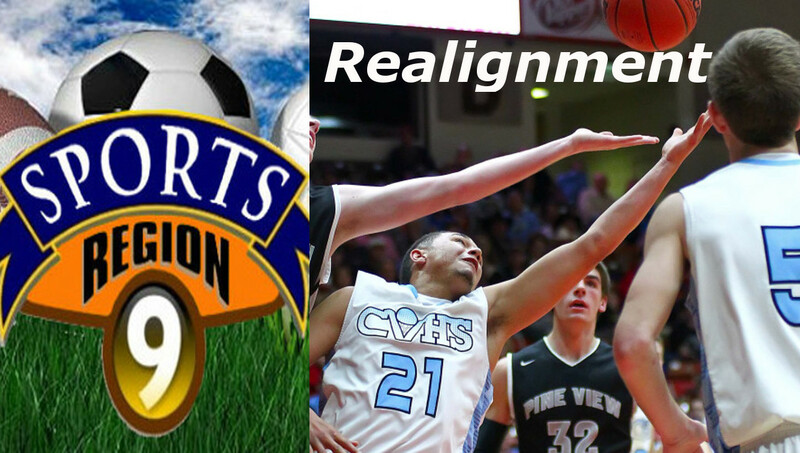 Canyon View will rejoin Region 9 in the fall of 2017. 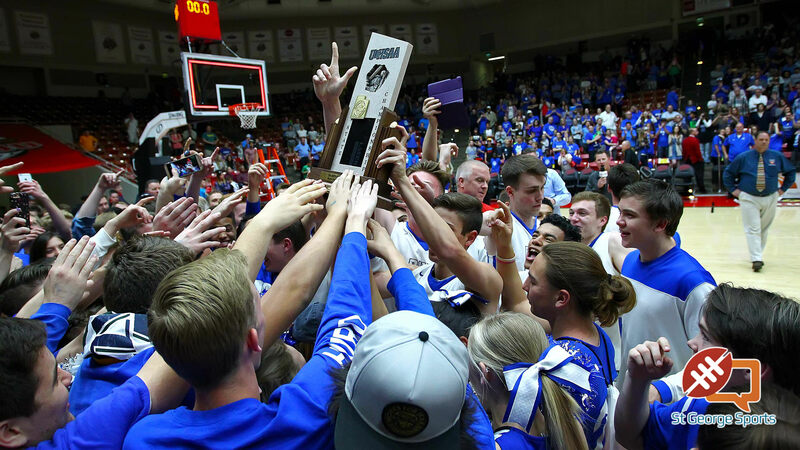 It’s not official yet, but the new classification and region alignment set forth by the Utah High School Activities Association looks to reunite Region 9 – as a 4A region – beginning later this year. 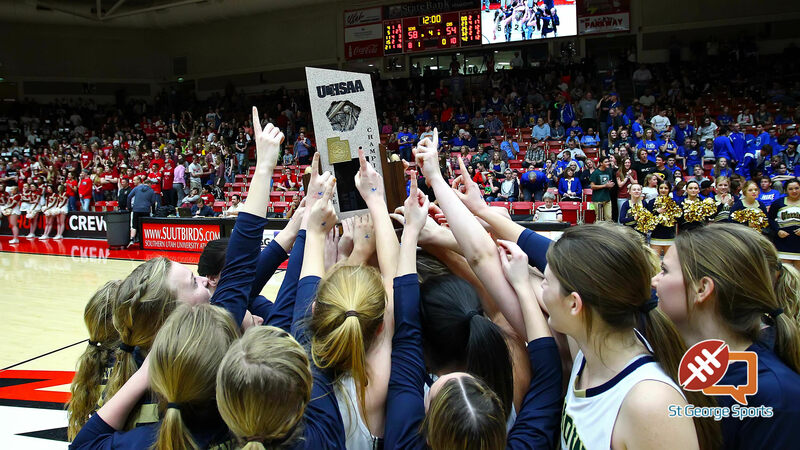 The UHSAA announced what it calls the “first consideration” for the new region and class alignments, which will add a sixth classification, “6A,” and re-qualify the old Region 9, including Canyon View, as a 4A classification. 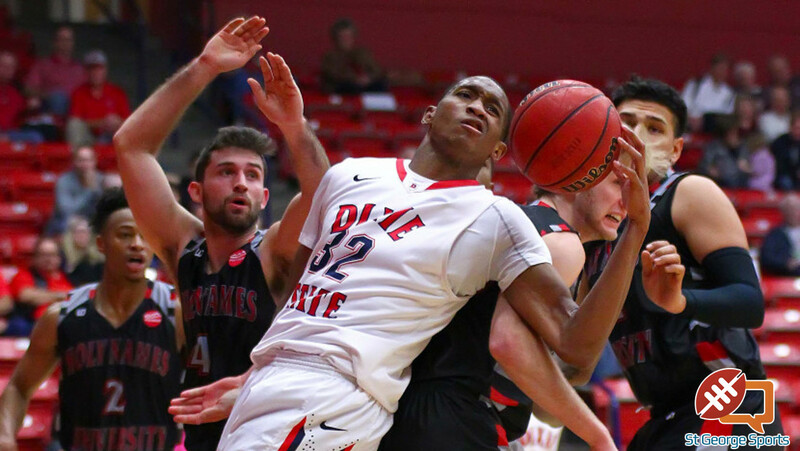 A strong opening of the second half surged Dixie State to a lead that it would not give up to get a huge win against undefeated and No. 3-ranked California Baptist 75-71 Thursday night. Trailing by five at intermission, the Trailblazers hit four of their first five shots to take an early 37-35 lead with 17:27 remaining. The lead see-sawed for the next four minutes, but when Dixie State point guard Brandon Simister drained two free throws with 13:50 remaining, the Blazers took the lead for good. Marcus Bradley followed those up with a three-point play to give DSU a 48-44 lead, the largest to that point. Legendary coach Sark Arslanian passed away Sunday afternoon at age 92. The sports world lost a coaching icon Sunday afternoon as Sark Arslanian passed away at his home in St. George at the age of 92. 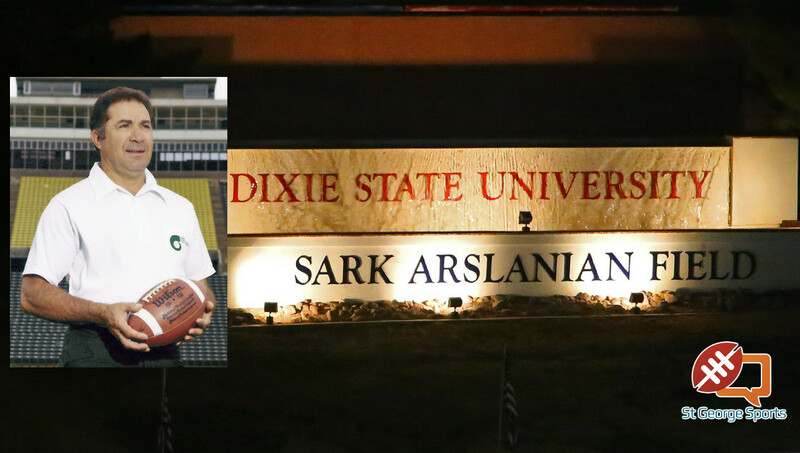 “Coach Sark,” as he was known throughout the region among his many contemporaries and former players, spent a good portion of his life in St. George, attending Dixie College and then later coaching football, baseball and track at the school. He also coached at Pine View High School in the twilight of his career in the late 1990s and spent his retirement in Utah’s Dixie. “Coach Sark” was born on February 4, 1924, in Fresno, Calif. He graduated from Granite High School in 1941, and enlisted with the Naval Air Corps, for which he served as an officer in the South Pacific until the end of World War II. He graduated from Dixie College in 1949, where he played football and basketball, ran track, and served as class president. He went on to earn a Bachelor’s degree from the University of Utah and a Master’s degree from Utah State University. On a rare wet and rainy night at Qualcomm Stadium, BYU capped off its 2016 season with a wild 24-21 win over Wyoming in the 2016 San Diego County Credit Union Poinsettia Bowl on Wednesday. BYU (9-4) led 24-7 in the fourth quarter, but a furious Cowboy (8-6) comeback made it a thriller in the final minutes. Wyoming cut the advantage to 24-21 and had the ball at the Cougar 32-yard line with 1:22 to play before senior Kai Nacua picked off a pass heading near the end zone to end the final threat of a comeback. The win was BYU’s first bowl win since its last trip to the Poinsettia Bowl in 2012 when the Cougars defeated San Diego State 23-6. 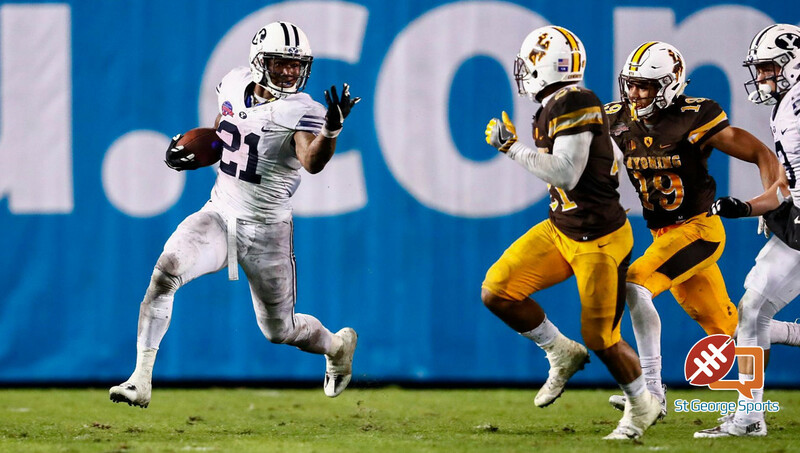 Senior running back Jamaal Williams put on a show in his final game at BYU, running for 210 yards and one touchdown on 26 carries. He finished his career with the most rushing yards in school history with 3,901 and the most games of 100 rushing yards or more with 16. He scored a TD in the game, just like he did in the 2012 Poinsettia Bowl. 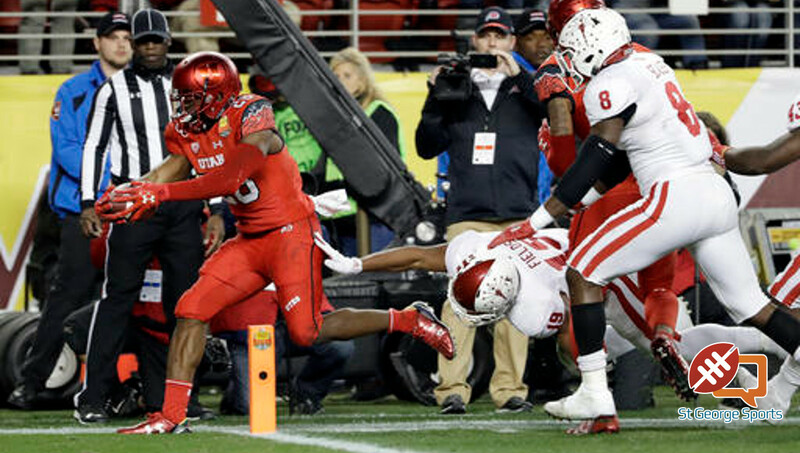 Joe Williams ran for 222 yards and a touchdown and Andy Phillips kicked a 27-yard field goal with 1:24 to play to lead Utah to its 14th victory in its past 15 bowl games, 26-24 over Indiana in the Foster Farms Bowl on Wednesday night. Tyler Huntley ran for another score and the Utes (9-4) forced three turnovers to spoil Tom Allen’s coaching debut at Indiana and improve Utah coach Kyle Whittingham’s bowl record to 10-1. Allen took over the Hoosiers (6-7) after Kevin Wilson’s sudden resignation this month. Allen had finished his first season at Indiana as defensive coordinator and is now tasked with rebuilding the team as he did in his one year with the defense. 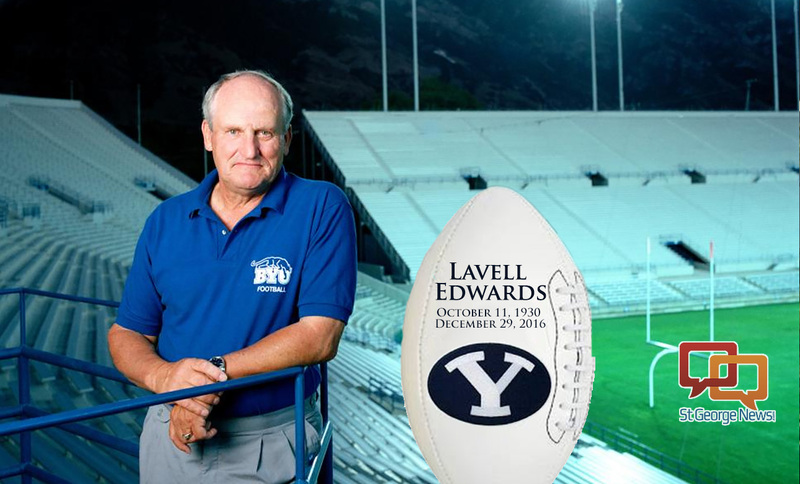 LaVell Edwards, who led BYU to national prominence with his dynamic passing offenses and became one of the most successful coaches in college football history, has died. He was 86. 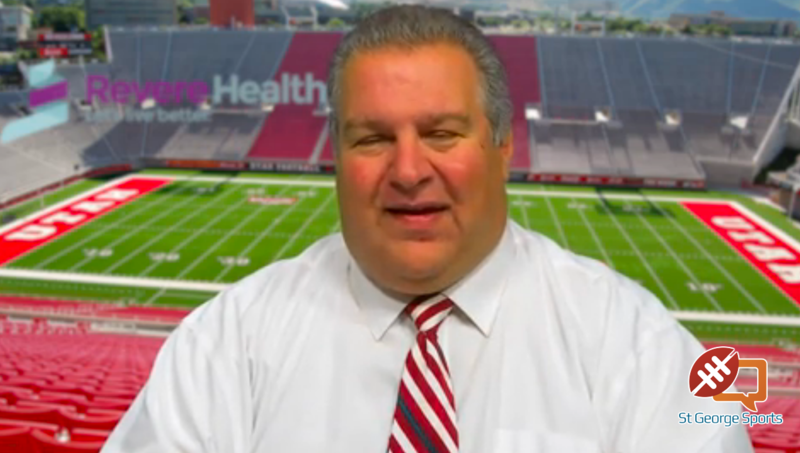 Athletic department spokesman Brett Pyne said Edwards died Thursday. Edwards coached the Cougars for 29 seasons before retiring in 2000. He had a record of 257-101-3, the seventh-most wins in FBS history. His teams won or shared 19 conference titles and played in 22 bowl games. His 1984 team was voted national champion, and he was inducted into the College Football Hall of Fame in 2004.